Only five more days… Horseman can’t wait for Melissa, his American girlfriend, to join him in Fiji. This time, he wants love to last. But the villagers have their own deadline: their chief has decreed Tanoa must atone for an ancient crime that still haunts the present. As Horseman counts the hours to Melissa’s touch down, he cannot know the dangers looming through the mountain mist. 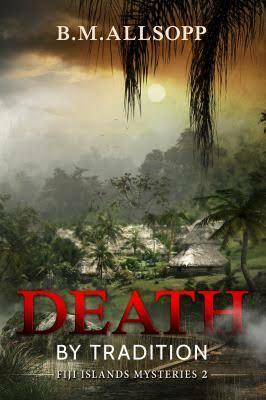 Death by Tradition is the second book in the series Fiji Island Mysteries, set on the island of Viti Levu. Allsopp lived in Fiji and taught at the University of South Pacific and her affection for the landscape and its people is evident in her writing. DS Joe Horseman, Fijian rugby star, now retired with a bung knee is watching the Suva Shiners (a rugby team made up of teenage street kids) score their first-ever goal when he receives a call. A young man has been murdered, his body laid out in a church in the village of Tanoa. The investigating team: Horseman and ambitious female DS Susila Singh, along with ‘raw CID transfer, Tanielo Musudroka’ must travel, deep into the highlands, out of radio contact. But Horseman has a problem: his girlfriend Melissa is flying in from the USA and Joe’s leave has been cancelled. But he’s a resourceful man and Melissa is invited to attend the village’s reconciliation ceremony, held to atone for an ancient crime – the killing of a Christian missionary by the villagers’ descendants. When a young female villager is strangled at Tanoa, Joe must connect seemingly unrelated events to find the murderer: a break-in at Suva’s national museum and theft of a historic artefact, a project to grow vanilla beans, traditional land leases, and a headman obsessed with a reconciliation ceremony. And Joe’s worried about Melissa’s safety with a murderer loose in the village. Allsopp has created a cast of believable and well-rounded characters, all possessing unique quirks and distinguishable traits, but what really hooked me was the setting. The heat and humidity steams off the page and at times I felt myself tangled in the rich descriptions of the flowers and vegetation. Death by Tradition would adapt well to screen and conjured in my mind the British TV series Death in Paradise. The only thing that jarred was the lovey-dovey talk between Joe and Melissa, which to me, didn’t ring true. However, I did enjoy the Fijian phrases sprinkled through the dialogue. The gentle graciousness of the Fijian people and their quaint hospitality and traditions is reflected in the rhythm and pace of Allsopp’s writing. The writing is slow, at times lulling, but never boring and certainly endearing like the novel’s characters. Joe’s eager to get on with the job but must tread carefully around the villagers’ laid back ways and is forced to sit through endless meals and drawn-out morning and afternoon teas. Sometimes I found myself joining the characters in a hut strewn with palm leaves, clapping my hands in deference to the host, then reaching out for a cup of tea and a scone with homemade jam. With a light-touch Allsopp reveals the racial tensions and the clash of modern and traditional Fijian values, which makes for interesting reading. Death by Tradition is a damn good read and will appeal to readers who enjoy a story rich in setting and who also delight in those little ‘Wow, I didn’t know that!’ moments. And for a non-sporting person, I didn’t even mind the references to rugby (there, I’ve said it)!